We encourage our clients to come as regularly as possible and to impress upon key decision makers how beneficial a year-round weekly session can be (as opposed to, for example, one or two six-week blocks within the academic year). However we also understand the constraints of budgets and curriculums and strive to make whatever sessions the children have as valuable as possible. We have run sessions in a variety of woodland settings including inner city nature reserves and school conservation areas. If your setting does not have a Forest School site we are happy to help you try to find a local patch of woodland and get the relevant permissions for Forest School use. Woodland does provide a much richer environment for free play so for that reason we do try to run sessions in woodland rather than school fields or meadows. We aim to promote a child-led and confidence-inspiring environment where children feel free to ask questions and show interest in anything, which we will subsequently help them to learn more about. We want engage all children who come to Forest School and will suggest more structured activities for children who are out of their element and withdrawn or simply less naturally curious. We will provide an inclusive, fun and interesting environment where children are free to choose how they spend their time and can develop every part of their potential; intellectual, emotional, social, physical, creative and spiritual. I am a fully qualified Forest School Leader and Outdoor Paediatric First Aider, confident to deal with any hazards and the associated risk that Forest School presents. As well as this, we carefully risk assess all activities including any ad hoc activities (such as tree climbing), to ensure the risk level is acceptable. We also carry out ongoing dynamic risk assessments during each session. We ensure appropriate supervision and support for any risky activities, but children will be encouraged to take risks (within sensible limits) if they want to. This teaches them how to manage risk themselves, turning them into more rounded and responsible individuals. We have full insurance. 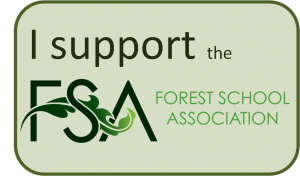 I am a Level 3 qualified Forest School leader and a member of the Forest School Association and of the Oxfordshire cluster group of Forest School leaders. I attend regular cluster group meetings and make an effort to attend other Forest School Leaders’ sessions to get new ideas and suggestions and to continue to develop professionally. I am always keen to undertake further training and to keep my knowledge up to date, and strive to be the best Forest School Practitioner I can be.